Porsche 910/8 Bergspyder and Porsche 917-001 at the Retrokclassics in Stuttgart. 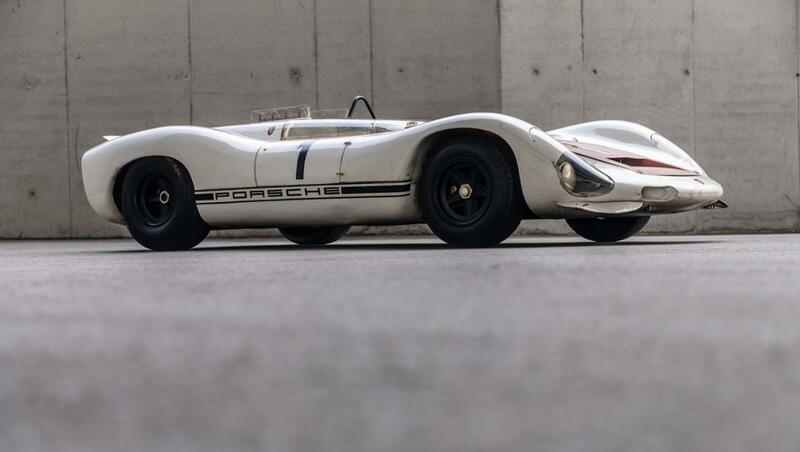 In the year that it celebrates its first double-digit birthday, the Porsche Museum is taking previously unseen vehicles from its collection to the Stuttgart Messe: the first Porsche 917 and the lightweight 910/8 Bergspyder. and two particularly special exhibits are sure to draw the crowds to the Porsche stand – the first is an outstanding milestone car that played a decisive role in Porsche racing history: museum mechanics have restored the first Porsche 917 ever built, with chassis number 001, to its original condition as at its 1969 world première. “The Porsche 917 was first revealed to the world on 12 March 1969 at the Geneva Motor Show. Exactly 50 years later, motorsport and vintage car enthusiasts can encounter the first 917 once again at Retro Classics,” announces Achim Stejskal. On top of that, also in attendance to answer questions will be racing legend Kurt Ahrens, who actually had the privilege of driving this racing car. He will be offering insights into the development of the 917-001 based on his experience of carrying out the vehicle’s test and fine-tuning drives in 1969, as a 29-year-old development driver. On both Saturday 9 March and Sunday 10 March, Ahrens will be available for expert discussion from 1.30 to 2.00 p.m. The presentation of the 917-001 at Retro Classics marks the start of this exceptional racing car’s anniversary year, and at the same time anticipates the Porsche Museum “Colours of Speed – 50 Years of the 917” special exhibition, which is set to open on 14 May. Alongside the 917-001, another rare museum piece will be on display for the first time in over 50 years: the 1967 Porsche 910/8 Bergspyder. Porsche won the European Hill Climb Championship with this car in 1967 and 1968, and weighing in at just 440 kg, the model is today a classic example of lightweight construction, where conventional materials have been replaced with titanium, magnesium, aluminium and plastic. Event visitors will be able to see the 910/8 Bergspyder in fully refurbished condition. When restoring vehicles from the historic company collection, the Porsche Museum always makes a priority of retaining original materials where possible, giving due respect to the history of each exhibit. With this in mind, the museum workshop team worked together with experienced historian Dr. Gundula Tutt to ensure that the delicate plastic skin of the 910/8 Bergspyder was properly preserved and restored. Historic motorsport will be represented with another 917 model: the Porsche 917/10, which was developed as an open-top version of the 917 for the Can-Am racing series in the USA and Canada, and which beat the American competition in six races out of nine starts in 1972. The Porsche Museum will also be celebrating the 50th anniversary of the Porsche 914 at the Stuttgart event. In the autumn of 1969, the 914 was presented at the International Motor Show (IAA) in Frankfurt as Germany’s first mid-engined series sports car. Visitors can look forward to seeing a 914/6, which is one of a total of eleven 914 exhibits set to be displayed at the Porsche Museum from 2 June as part of the “50 Years of the 914 – typically Porsche” special exhibition. Also on show will be a 356/2 Gmünd Cabriolet that includes one of the two Keibl bodyshells presumed to be in existence, and which was delivered in February 1949. Alongside these historic vehicles, the Porsche Museum will also be employing the latest technology so visitors can experience one of its oldest exhibits, as part of the Museum’s “Mission Future Heritage”. Attendees will be invited to virtually step back in time, donning data glasses to travel via virtual reality (VR) to the Porsche workshop in Gmund, Austria in 1948, and work on a 356 coupé. Racing legends Hans Herrmann and Kurt Ahrens are expected to hold an autograph session at the Porsche stand on both the Saturday and the Sunday, from 2.00 to 3.00 p.m. Hans Herrmann is among the most successful Porsche AG works racing drivers, with more than 80 overall and class victories to his name, while Kurt Ahrens won long-distance races for Porsche in Zeltweg (1969) and at the Nürburgring (1970). The 2016 Le Mans overall winner, Marc Lieb, will also be available for autograph requests on Sunday. The museum shop will be selling a range of vehicle miniatures and books from its own publishing house, Edition Porsche Museum. Porsche Drive will present its services and current models from the product range. Porsche Experience will be presenting the Porsche 911 GT2 RS, along with various driving events that offer Porsche enthusiasts the chance to experience for themselves the power of this high-performance sports car and many other Porsche models. Retro Classics takes place at Stuttgart Messe from 7 to 10 March 2019. This year, the Porsche Museum will be in Hall 1 at Stand A72.